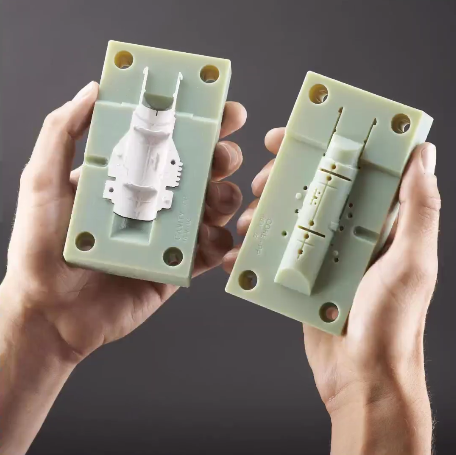 During the design process, 3D printed injection molds usually come in to play around the second phase of prototyping when you start functional testing. By printing the mold you are going to inject, it enables you to use real end material to run a full range of tests and get mold verification before sending your design to manufacturing. The key to injection molding is making sure conditions are ideal for injecting. The life of the tool depends on factors such as temperature, what material is used and product size. Generally, the more abrasive the material, the less you can use the tool. That being said, there are tips and tricks such as increasing the draft angle, using sprue brushing, under-sizing ejector pins and accelerating cooling that can help improve the cycles you can get out of your tool. Similarly, blow molding has the same type of thought process as injection molding. Some advantages of this technique are that it is fast, efficient, automated and often times requires minor modifications. These are usually printed as stand-alone molds, mold bases or mold inserts with metal nozzles. In addition to metal forming, thermoforming is another forming application, which is mostly used with thermoplastics. 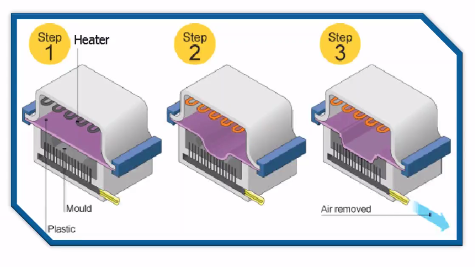 This consists of three main steps: (1) clamping mould mate together, (2) softening the thermoplastic sheet by heating and (3) vacuuming in one direction to form the plastic sheet to the mould shape. While thermoforming works with PolyJet materials, FDM Thermoplastics are usually recommended for this application because they are naturally porous and offer better vacuum flow. Material choice plays a significant role in tool design. Fiber layups require a lot of heat and pressure, so there are many key considerations when approaching this application. Cure temperature and pressure, CTE, accuracy/tolerances, design features, build orientation, vacuum bagging and surface preparation are all factors to take into account for a successful and realistic layup. When done correctly, applying this application to your design process can increase part functionality, product complexity and product customization while also improving low volume production, economic sustainability and supply chains. Soluble cores is another method that offers significant cost reduction and exceeds complex geometries. The process consists of designing the core, building the FDM core, sanding and sealing the core, wrapping or winding the composite, consolidating and curing the composite, and lastly, dissolving the FDM core. Essentially, soluble support material is used to create negative space to mold around, and then when dissolved, it leaves a seamless part. To see how some of our clients use these applications, watch our full on-demand webinar above, or click the link below.